Kneading bread dough can be one of the most enjoyable steps of bread baking, but the idea of it can intimidate some novice bakers. Once you understand the simple steps, however, you will see how basic the process is and won't shy away from recipes calling for kneading. 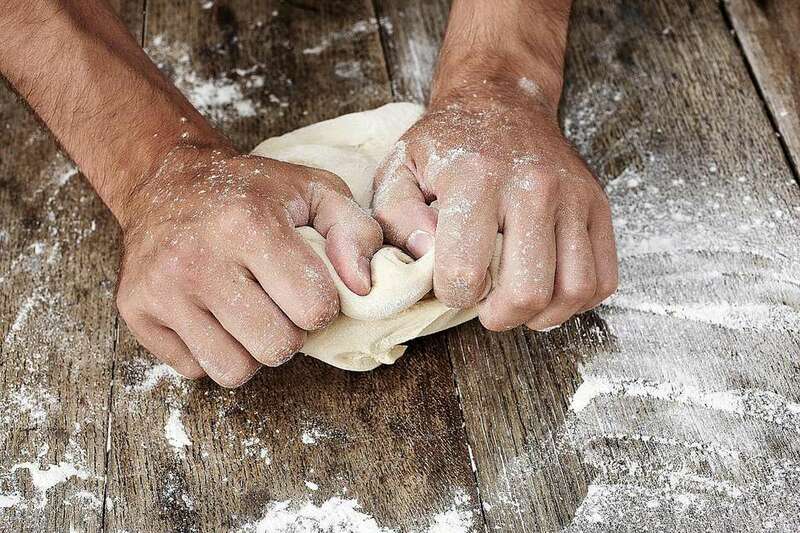 When you think about it, people have been kneading dough by hand for thousands of years, so why can't you? It only takes 10 minutes, a little flour, and your own two hands. The reason kneading is an important part of bread making is to create structure and strength in the dough, leaving it silky and soft with a little cushiony feel. Flour contains two proteins that combine to form gluten, which is responsible for creating the elastic texture in the dough. After the dough ingredients are mixed, the proteins are in a random pattern and knotted together. When the dough is kneaded, the proteins begin to line up in such a way that strands of gluten develop and create a structure that allows for the trapping of gases and the dough to rise. Kneading only takes a few minutes, requires just your hands, a flat surface, and a bit of flour to keep the dough from sticking. Use a counter or tabletop that allows you to extend your arms to knead the dough while not making you hunch over a table. Sprinkle the surface with flour and scrape the dough out of the bowl onto the countertop. Begin kneading the dough, pushing it down and then outward, only using the heels of your hands. Fold the dough in half toward you and press down. Then use the heels of your hands again to push down and outward, lengthening and stretching the strands of gluten and dough fibers. Turn the dough about 45 degrees and knead again with the heels of your hands. If it is getting sticky, add a little more flour. Continue to knead, folding and turning the dough, until it is smooth and supple. Kneading is a basic and repetitive technique, but there are still a few things to keep in mind to make the process easier and more successful. Kneading can be messy. You may want to wear an apron or old clothes to prevent flour from getting on your good clothing. Always keep a measuring cup of flour beside your work area to use to prevent the dough from sticking to your counter or kneading board as well as for lightly dusting your hands with flour to keep the dough from sticking to you. Be mindful of adding too much flour, though, since doing so can result in a crumbly bread. If your dough continues to be sticky but you feel like you have added enough flour, let the dough sit for 5 minutes, which allows the water to absorb the flour; this will make the dough easier to handle. If you are unsure if the dough has been kneaded enough, you can do the "windowpane" test. Remove a small bit of dough (about the size of a golf ball) and hold it between your thumb and first two fingers of each hand so the dough is in front of you. Then, gently pull your fingers and thumbs away from each other to stretch out the dough. If the dough doesn't break, it means you have kneaded it enough; if the membrane pulls apart, you need to knead it a bit more.